Clear statues in front of Chocobo Stables. Silence Vanguard Scorpions. Clear statues at Auction House. Clear statues at South Gate. Clear statues to NM Be'Ebo Tortoisedriver. Silence Vanguard Scorpions. (Optional) Clear statues on the upper level of Ore Street. Clear statues to Aa'Nyu Dismantler. Clear statues to Zeruhn Mines, including NM Ze'Vho Fallsplitter. 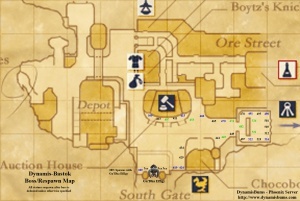 Clear statues to Bastok Markets zone, including NM Ke'Dhe Cannonball. Camp in front of the Auction House, away to avoid respawning statues on the steps, but not close enough to aggro the Effigy Shields. Two Sleepga users sleep the Effigy Shields, while a player with increased movement speed kites Gu'Dha Effigy through previously-cleared areas. Defeat accompanying Adamantking Effigy 389. 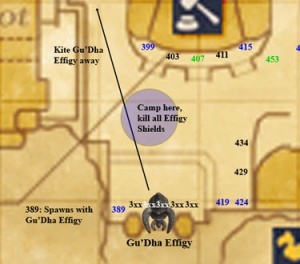 Defeating Gu'Dha Effigy grants a 30-minute time extension. Vanguard's Scorpions cast Breakga often. Make sure they are silenced and slept at all times while fighting other Vanguard. 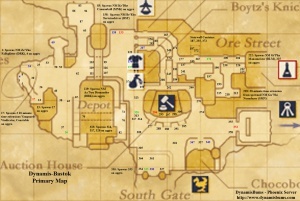 (Smaller groups) It is possible to pull the lower Ore Street area without linking statues on the upper level. This page was last edited on 13 August 2017, at 03:03.